From Delhi airport, we will drive you to Nainital. Check-in to hotel after arrival. Devote time for relaxation after the long journey or you could explore the bustling Mall road area. There is a lot to do under Nainital tourism packages. The ropeway with a cable car takes you to the View Point where you can see distant peaks. Nainital has a well-maintained zoo to catch up on some Himalayan wildlife. You can also hike or ride a horse to Tiffin Top and take panoramic views of the mountains. Your evening time should be dedicated to boating on Naini Lake. Have a healthy breakfast as you check-out and begin your Jim Corbett national park tour package. Arrive in Corbett and check-in. The rest of your day is at leisure. You can opt for the evening jungle safari. Take the morning jungle safari. Visitors come in huge numbers to get a glimpse of the reclusive Tiger with Jim Corbett packages from Delhi. You can also tour the Garjiya Devi temple near Ramnagar orthe Kalagarh Dam where you can witness a number of bird species. Finish your Jim Corbett packages tour in style and capture amazing photos in the morning time around the park. Postbreakfast, check-out and drive back to Delhi airport for your onward journey. One of the highly popular hill stations in Uttarakhand, Nainital is a part of the lake district set in the foothills of Kumaon mountain range of the Himalayas. It has procured its name from the Naini Lake, which is centred around the small town. It has beautiful weather all year round. There’s a vibrant mall road where you can eat, shop or walk along the lake area. Corbett forms part of almost any Nainital tour package from Delhi since it comes under the same district. 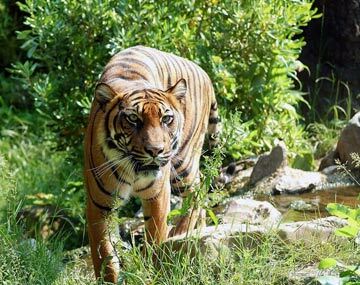 Jim Corbett national park is famous for watching Tigers in the wild. There are a number of safari options available like jeep, canter or aboard an elephant. The park is extremely beautiful and rich in grasslands which makes the safari a grand experience. Our Delhi to Nainital tour package covers a smooth and comfortable transit to your hotel at Nainital. We will delight you with warm hospitality as you relish breakfast with a fascinating view of the surrounding hills. Many interesting places are planned for your Nainital holiday package. You will get ample opportunity to soak up the sun and the pleasant mountain air as you visit different places. Jim Corbett national park packages are curated to help you rejuvenate in the lush jungle environment and yet partake in the activities provided by the resorts. Personal expenditures such as laundry, telephone calls, beverages, tips, etc. Surcharges will be applied if the travel date is during national holidays, festivals or long weekends. Rates may change in case of any updations in Govt. tax or other taxes. BookOtrip.in is liable to change/modify or cancel the offer any time without any prior notice. Nainital is a beautiful hill station. I had gone with my friends and we had a great time. I am a nature love so for me it was cherry on the cake. Arrangement done by Bookotrip was great .